Public evaluations of news organizations’ performance on key measures such as accuracy, fairness and independence remain mired near all-time lows. But there is a bright spot among these otherwise gloomy ratings: broad majorities continue to say the press acts as a watchdog by preventing political leaders from doing things that should not be done, a view that is as widely held today as at any point over the past three decades. In the wake of revelations about government activities, including the NSA surveillance program and the IRS targeting of political groups, nearly seven-in-ten (68%) say press criticism of political leaders keeps them from doing things that should not be done, while just 21% say press criticism keeps leaders from doing their job. Support for the media’s watchdog role has risen 10 points since 2011 even as other press ratings have shown little sign of improvement. About equal majorities of Republicans (69%), independents (69%) and Democrats (67%) view news organizations as a check on political leaders and there has been a significant rise in this view across nearly all demographic and political groups. Young people especially have become more likely to say news organizations keep political leaders from doing things that should not be done, a shift in opinion that has taken place concurrently with rising concerns about civil liberties. Outside of its role as a watchdog, the press receives broadly negative ratings from the public on core performance measures. Two-thirds (67%) say that news reports are often inaccurate, and even greater percentages say that news organizations tend to favor one side (76%) and are often influenced by powerful people and organizations (75%). Ratings of news organizations have declined steadily since Pew Research first began tracking attitudes in 1985, and many current ratings stand near all-time lows reached in 2011. The current media landscape is starkly different than in 2001, when 45% said newspapers were their main source for news and just 13% cited the internet. The percentage turning to television for news has changed little over this same period of time. In the current news environment, a slim majority says that journalists are more important than in the past because they help make sense of all the information that is available (54%), while 38% say that journalists are less important than in the past because people can get information without their help. Young people under 30 are as likely as older Americans to say that journalists are more important these days to help make sense of the amount of news and information available. And there is little difference in views on this question by those who have different main sources for news. Most who cite television (59%), radio (56%), newspapers (55%) or the internet (51%) as their main source for news agree that journalists are more important than in the past to help make sense of available news and information. While most say journalists play a more important role in helping people navigate the news, their contributions to society more generally are seen as far less significant – especially when compared with other professions. Another recent survey by the Pew Research Center found that just 28% say journalists contribute “a lot” to society’s well-being, down from 38% in 2009. The public gives far better ratings to the contributions of the military (78%), teachers (72%) and doctors (66%). By more than three-to-one, the public says that news organizations’ criticism of political leaders keeps them from doing things that should not be done (68%), rather than keeping leaders from doing their job (21%). 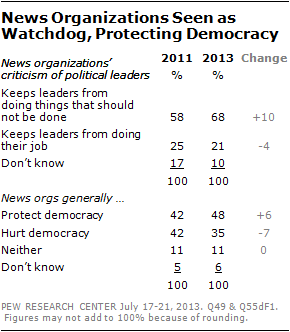 In addition, more say that news organizations protect (48%) rather than hurt (35%) democracy. In 2011, the public was divided over whether the press protected or hurt democracy (42%-42%), and Americans were 10 points less likely to view the press as an effective watchdog. The increase in regard for the press’s watchdog role has taken place across nearly all demographic groups. Young people, in particular, have become much more likely to say the press prevents misbehavior by political leaders. In 2011, a slim 56% majority of those 18-29 said press criticism prevented political leaders from doing things that should not be done; today, three-quarters (75%) say this. Republicans, Democrats and independents have all become about 10 points more likely to view the press as an effective watchdog. 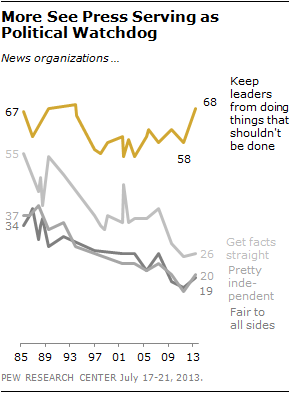 Nearly identical majorities of Republicans (69%), independents (69%) and Democrats (67%) say news organizations’ criticism of political leaders keeps them from doing things that should not be done. Though the public gives news organizations credit for their role as watchdogs, they offer much more negative ratings of other aspects central to the press’s core mission. Overwhelming majorities express doubts about news organizations’ independence: 76% say news organizations tend to favor one side and 75% say that they are often influenced by powerful people and organizations. On fundamental questions of accuracy and transparency, most say that the press tries to cover up its mistakes (71%) , rather than admit them (20%), and 67% say news stories are often inaccurate while just 26% say news organizations get the facts straight. Most Americans (58%) describe news organizations as politically biased in their reporting; only 30% say they are careful that their reporting is not biased. Ratings are no better for the press’s news judgment. In determining what news is fit to report on, far more say news organizations focus on unimportant stories (65%) rather than on important ones (28%). Ratings of the press have become much more negative since Pew Research first began measuring attitudes in 1985. Most of the press ratings tested in this survey are at or near all-time lows reached in 2011. In many cases, the decline in ratings has been dramatic. For example, in 1985, more said news organizations got the facts straight (55%) than said they were often inaccurate (44%). Since then there has been a 29-point decline in the percentage saying the press gets the facts straight. On the positive side, the public maintains respect for the professionalism of news organizations. Two-thirds (67%) say news organizations care about how good a job they do while just 26% say they don’t care. 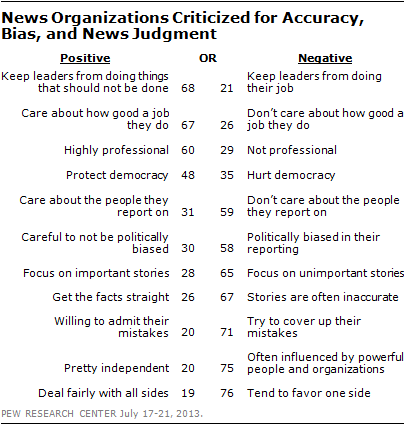 In addition, by a 60%-29% margin, more see news organizations as highly professional than as not professional. As in past media attitudes surveys, Republicans are more likely than Democrats to negatively rate news organizations, offering significantly more critical evaluations of the press on eight of the 11 measures tested. One fundamental area of partisan disagreement is over the role the press plays in a democracy. 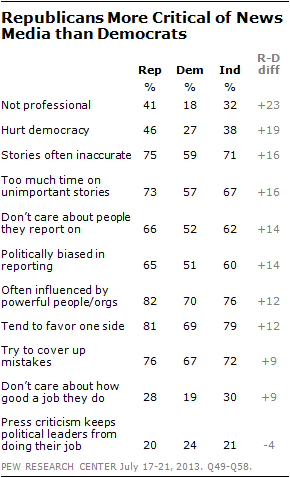 Far more Democrats say the press protects democracy (59%) than hurts democracy (27%). 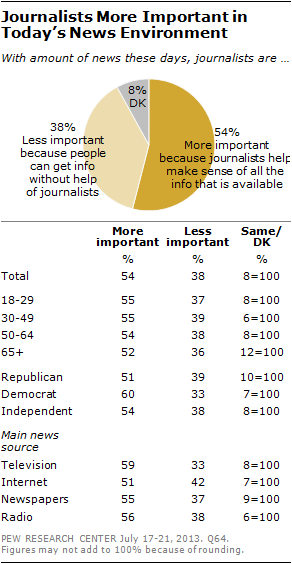 By contrast, as many Republicans say news organizations hurt (46%) as help (43%) democracy. A broad 74% majority of Democrats describe news organizations as highly professional; Republicans are divided on this question: 50% say they are professional, 41% say they are not. On several other measures Republicans and Democrats both offer negative ratings of the press and differ only in the magnitude of their criticisms. For example, Republicans are 16 points more likely than Democrats to say news stories are often inaccurate, but this view is shared by a majority of both parties (75% of Republicans, 59% of Democrats). Similarly, 73% of Republicans say news organizations spend too much time on unimportant stores, while a smaller 57%-majority of Democrats agree. Amidst broadly negative views of news organizations generally, the public has some positive things to say about journalists themselves. 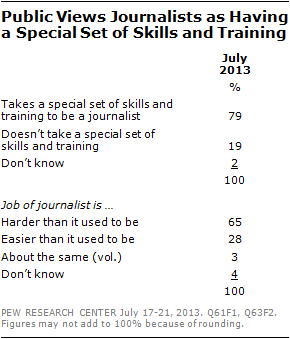 Nearly eight-in-ten (79%) say it takes a special set of skills and training to be a journalist while just 19% say it does not. In addition, 65% say the job of a journalist is harder today than it used to be, 28% say it is easier. These views are shared broadly across demographic groups. Comparable majorities of Republicans and Democrats say it takes special skills to be a journalist (79% and 82%, respectively) and that journalism is a harder job today than it used to be (68%, 70%). The balance of opinion on this question has changed little in recent years, with a plurality consistently describing news organizations as liberal, and about a quarter saying they are conservative. 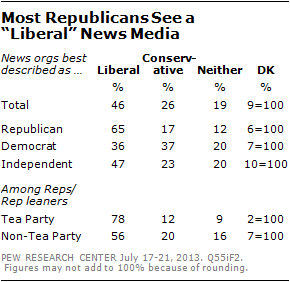 There is a modest difference of opinion within the Republican Party on this question: 78% of Republicans and Republican leaners who agree with the Tea Party describe news organizations as liberal, compared with 56% of Republicans who do not agree with the Tea Party. Those who cite the internet as a main source for news offer more critical ratings of the press on several key measures than those who do not go online for news. 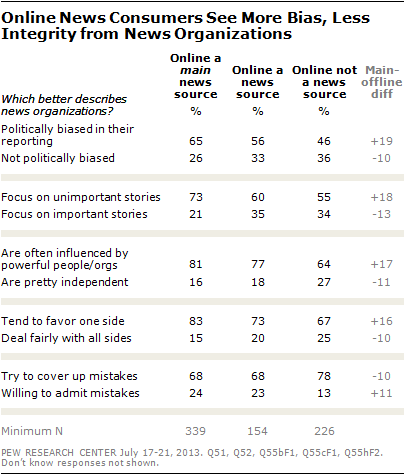 Those who use the internet as a main source for news are more likely to say news organizations are politically biased (65%) rather than not politically biased (26%). By contrast, those who do not use the internet to get news are much more divided: 46% say the press is politically biased, 36% say they are not. Those who get most of their news online are 18 points more likely than those who don’t use the internet for news to say the press spends too much time on unimportant stories. Internet news users also are 17 points more likely to say that news organizations are often influenced by powerful people and 16 points more likely to say the press tend to favor one side. One exception to this pattern is on the question of press transparency: 78% of those who do not use the internet for news say the press tries to cover up its mistakes. 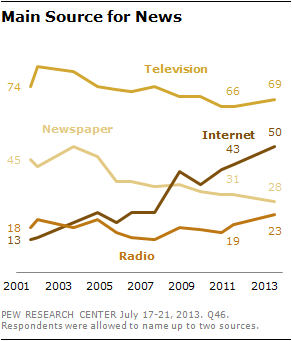 Those using the internet as their main source for news are 10 points less likely to take this view (68%). The internet is now the main source for national and international news for those under the age of 50. Overall, 71% of those 18-29 cite the internet as a main news source, more than the percentage that cites television (55%). Among those 30-49, 63% say the internet is where they go to get most of their news, up 13 points from 2011 and, for the first time, the percentage of this group citing the internet as their main source matches the percentage who say television is their top news source. (Respondents were allowed to name up to two sources). 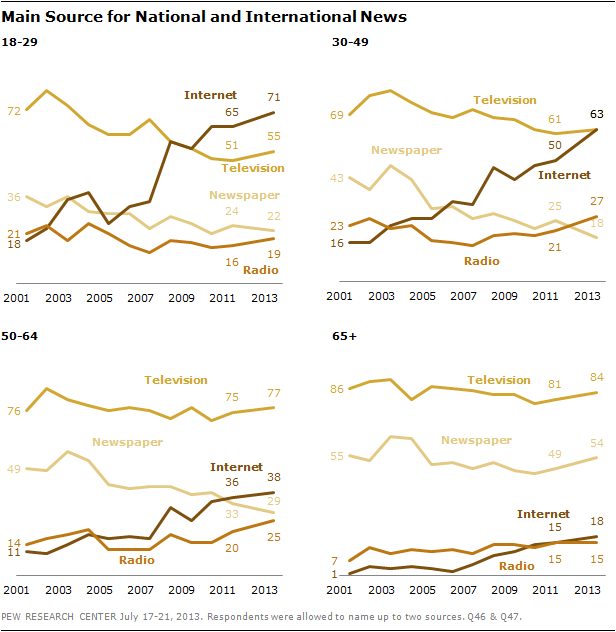 For those ages 50 and older, television remains the dominant source for news. About three-quarters (77%) of those 50-64 say television is a main source for news, compared with 38% who cite the internet. For those ages 65 and older, 84% turn to television for most of their news, 54% rely on newspapers and just 18% say the internet is a top news source. For both those ages 50-64 and 65 and older, there has been no significant increase in the percentages citing the internet as a main source for news since 2011.